It's Friday, and we have the Pioneer IoT Shield, NovelKey's Tactile Big Switch and a handy USB adapter! Hello there, everyone, and welcome to another Friday Product Post here at SparkFun Electronics! Last week we teased a very special partnership, so this Friday we are very happy to announce the Pioneer IoT Add-On Shield. 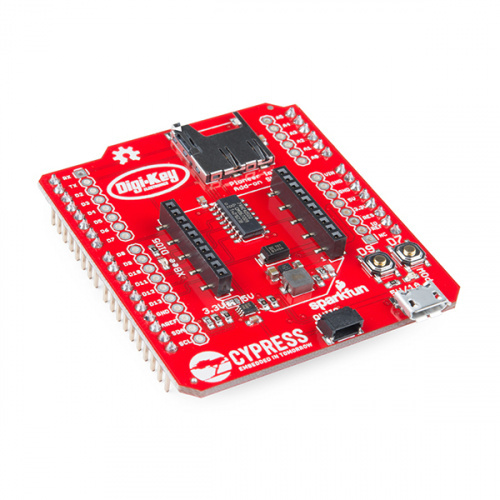 This was a joint effort between SparkFun, Cypress and Digi-Key to develop a special addition to the new PSoC 6 board. Additionally, we now have the NovelKeys Tactile Big Switch and a USB to Micro-B Adapter both available today as well! Alright, enough of the introduction; let's take a closer look at our new products this week! The Pioneer IoT Add-On Shield is a unique board designed to add more functionality to the PSoC 6 from Cypress while remaining useful and practical for plenty of other Internet of Things applications. Each Add-On Shield is a pretty simple board with an equally simple layout that provides XBee, Qwiic and microSD functionality not only to the PSoC 6 but also to any board with an Arduino R3 shield format. On top of designing this board with a reliable IoT performance, we have written a guide that will show you how to communicate with a Raspberry Pi via Bluetooth® and WiFi, as well as how to communicate between a PSoC 4 BLE Pioneer Board and the PSoC 6 Pioneer Board via Bluetooth Low Energy. Assembling your own custom keyboard is quickly becoming a fun hobby among computer enthusiasts, but what if you could build a 6-foot-long one? 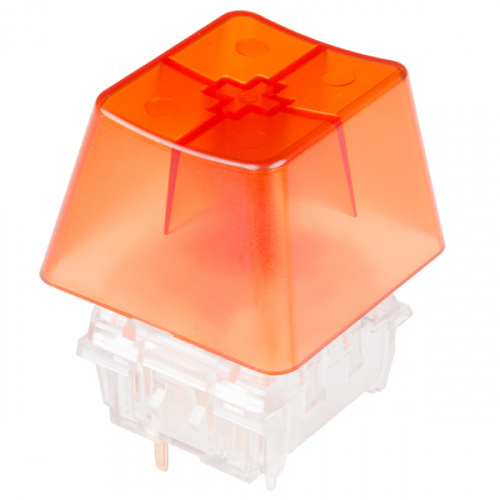 This tactile Big Switch from NovelKeys looks like a normal mechanical Cherry MX switch, but the major difference is that it is four times the size! Each of these switches is 100 percent fully functional and can be used to build your very own giant keyboard or numeric 10-key pad, an emergency eject button for your favorite space flight simulator, or a giant "nope-outta-there" button for times when you see a scary picture on the internet and need to backpedal as quickly as possible. Really, whatever you can do with a regular-sized keyboard switch can be done with a NovelKey! 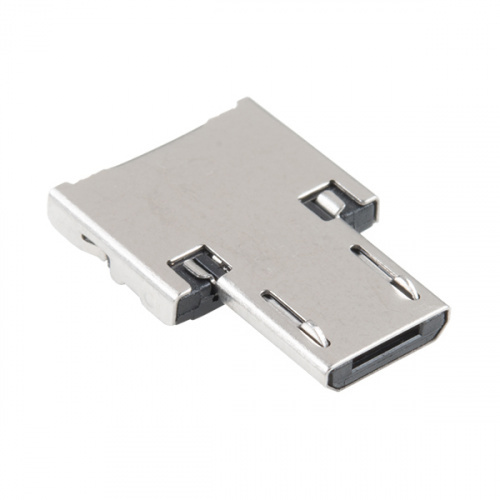 It's tiny, it's handy, and it can give your normal USB-equipped device a micro-B connector! With the USB to Micro-B Adapter you can make a flash drive connect to your tablet, connect a keyboard to your phone in order to text with ease, attach a Bluetooth® dongle to your RPi Zero, and more! Since this adapter is super small, it is very easy to transport anywhere you might need it --- making it extremely convenient to have in a pinch. And that's it for this week, folks! As always, we can't wait to see what you make with these products! Shoot us a tweet @sparkfun, or let us know on Instagram or Facebook. We’d love to see what projects you’ve made! We have come a long way from demonstrating a switch with a battery and light bulb! I think your demo took over a billion transistors. Was wondering what the thing stuck in the plant was -- you finally said at the end that it's the microphone! (I'd been thinking maybe it was some sort of sensor that you were going to demo...) One quick question (I suspect I know the answer, which is "yes") is whether the "Add-on Shield" is compatible with the Red Board? Of course, my usual rant about "no RTCC" applies to this, as well (though I'll give you a pass if the PSoC6 has one built-in).